BMW 3 Series: cleaner and more powerful | What Car? BMW's revised 3 Series Coupe and Convertible will get more power with improved fuel economy and lower emissions when they go on sale in March. Along with the performance and efficiency improvements, the cars will also receive styling and interior updates. The company will also launch the new BMW 320d Efficient Dynamics Saloon the manufacturer's cleanest 3 Series ever. The revised 3 Series Coupe and Convertible get new front and rear lights, along with a revised grille and new front air dam. The face on both models has been subtly restyled with the addition of a chrome strip around the grille, LED lights, indicators and side repeaters. The new front air dam is embellished with matt aluminium fins, which BMW says give the car a wider and more dynamic look. The rear clusters get LED light bars and a restyled rear bumper is designed to make the car look lower and more dynamic. Three exterior colours will be available: Vermillion Red, Deep Sea Blue and Mineral White. Inside, Dakota leather is standard on all Coupe and Convertible models, while a new Anthracite Bamboo trim completes the interior update. M Sport variants, which account for 65% of all BMW 3 Series Coupe and Convertible sales in the UK have also been updated. They get a revised front spoiler design, new 19-inch alloys and the option of Mineral White paint. The 320d engine in the Coupe and Convertible puts out 181bhp, 7bhp up on the previous versions. The Coupe covers the 0-62mph dash in just 7.5 seconds, while fuel consumption is improved by 1.2mpg to give an average of 60.1mpg. Emissions are cut by 3g/km to 125g/km. Figures for the Convertible are 0-62mph in 8.3 seconds, with average fuel consumption of 55.4mpg and CO2 emissions of 135g/km. The flagship 335i has had its fuel consumption and emissions reduced to 151g/km for the Coupe and 160g/km for the Convertible. These figures drop the Coupe to VED tax band J and the Convertible from L to K.
The 335d Coup now records an average of 42.8mpg, an improvement of 0.6mpg, and emissions of 174g/km. The cut in CO2 means the car now qualifies for VED band H, a tier below its previous position. The BMW 320d Efficient Dynamics saloon will be the cleanest, most efficient BMW ever. With emissions of 109g/km, it is the first sub-110g/km premium car. It also does an average of 68.9mpg, and will cost just 35 in annual road tax. Its 161bhp engine can take it from 0-62mph in 8.0 seconds and on to a top speed of 142mph. The chassis ride height has been lowered by 15mm, while unique 16-inch 'aero' alloys come as standard and are equipped with low-rolling-resistance tyres, all designed to improve aerodynamics and reduce drag. The best news is that the 320d Efficient Dynamics Saloon will cost 27,280 (OTR) the same as the 320d SE saloon. Prices for the new BMW 3 Series Coup start at 27,845 (OTR) for a 320i SE and 30,200 (OTR) for a 320d SE. This rises to 40,130 (OTR) for a 335d Coupe M Sport. 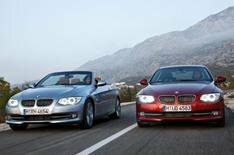 The BMW 3 Series Convertible starts at 32,905 (OTR) for a 320i SE and 35,115 (OTR) for a 320d SE. The 330d Convertible M Sport will cost 41,890 (OTR). All of the new BMW 3 Series variants go on sale in the UK on March 20.